viagra uk purchase I created this cozy because my local coffee house doesn’t provide the sleeves to protect against the heat. 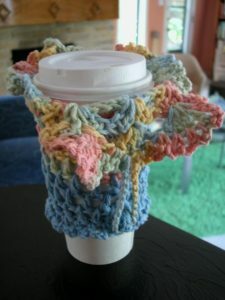 Plus, the coffee always splashes out as I’m driving so I have designed this cozy to button closed and soak up any splashes. Button it open when you are ready to drink. And since it’s cotton just throw it in the wash when needed. 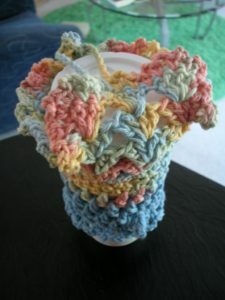 http://maientertainmentlaw.com/?search=can-discontinuing-lasix-cause-breathlessness Change colors at any point to customize your coffee cozy. I have used a variegated contrasted by a solid for the one pictured. http://cinziamazzamakeup.com/?x=comprare-viagra-generico-200-mg-spedizione-veloce Ch 36, slip st to first chain to form ring (be careful not to twist the chain). Rnd 4: Slip st in next st and in between the 2nd & 3rd sts of fan (center of fan). Ch 3, 3 dc in same space, *4 dc in between 2nd & 3rd st of next fan* twice. Rnd 5: Ch 1, turn so that wrong side is facing. Slip st in next st and in between the 2nd & 3rd sts of fan (center of fan). Ch 3, 3 dc in same space, *4 dc in between 2nd & 3rd st of next fan* twice. Rnd 6: Ch 1, turn so that right side is facing. Sc in top of same st. *ch 3, sc in next st* five times. Ch 20, sc in next st. *ch 3, sc in next st* around until you are exactly opposite the ch 20 loop. **to make button** 5 dc in same st, remove hook and insert in top of first dc, pull up loop and ch 1 (pull tight to make bobble “button”). Sc in same st. *ch3 sc in next st* around. Slip st to beginning sc. Fasten off. Turn cozy upside down and with right side facing, you will now be working in the back of the foundation chain. Rnd 1: Join with a sc in any ch. *Ch 1, skip one ch, sc in next ch* around. Slip st to beginning sc. Rnds 2 & 3: Slip st into next ch 1 space. Ch 1, sc in same space. *Ch 1, skip one ch, sc in next ch* around. Slip st to beginning sc. Rnds 4 – 6: Slip st into next ch 1 space. Ch 4, * Dc in next ch 1 space, ch 1* around. Slip st to 3rd ch of beginning ch 4. Rnd 7: Slip st into next ch 1 space. Ch 3, Dc in each st around until directly under the ch 20 at the top. Work bobble button as before. Dc in remaining sts around. Slip st to top of beginning ch 3. Rnd 8: Ch 1, sc in same st. Ch 3 *sc in next st, ch 3* around. Slip st to beginning sc. Fasten off. Be sure to click the icons below to share this on your fave social media sites!